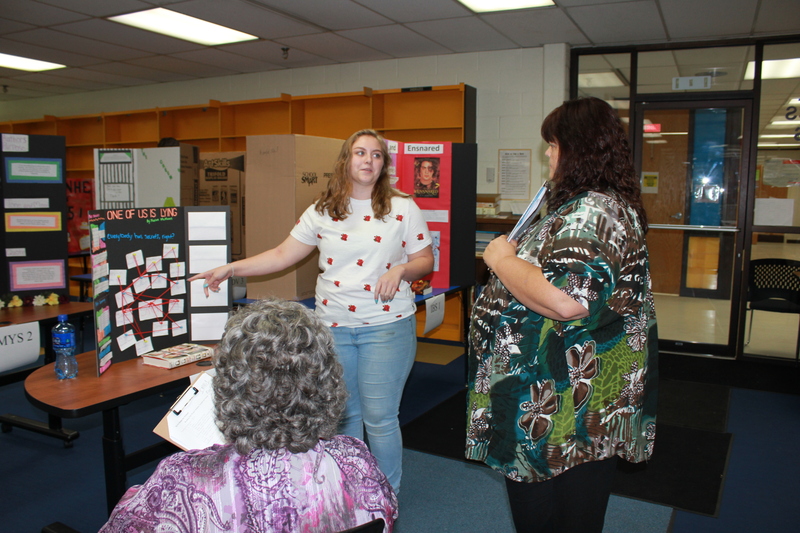 The literature fair, coordinated by Mrs. Murphy in the Media Center on Wednesday, September 19, was considered a success. The student turn out was impressive, leaving the judges with a hard time determining the winners. Alex Rose and Mystie Johnson. “Afterwards, many teachers came to me and told me that kids were happy to present books that they love and do something creative. When winners were announced, they were even cheering,” says Mrs. Murphy on the outcome of the literature fair. Suzanna Ward, Kris Ward, Denny Dorsey, and Susie Rogers were the judges. The winners chosen by them will go on to the county fair held at New Life Christian Academy on October 3. The participants and Mrs. Murphy worked very hard this year. From forwarding information to scheduling judges, without Mrs. Murphy the fair would not be possible. Many students go the extra mile in creating their projects as well. One in particular consisted of a bridge made out of popsicle sticks, which stood out tremendously. If nothing else, Mrs. Murphy hopes that the students take away an inspiration to create and read. “I feel that it’s important that young people understand that there is a reader in everyone. He or she just has to find the right book,” she says. Next Mrs. Esteban Staying in U.S.